What the dress is, Karayol explains, is an organic waste container that supports seeds on the outer layer in whatever configuration you desire. Slipping waste matter into its pockets maintains the quality of the soil, while experimenting with different plants sustains a sense of novelty for those who crave it. “What is better than a beautiful garden you can carry with you wherever you go?” Karayol says. Mesh remains a concept—for now, at least—that evokes the less-appealing aspects of city life, but Karayol and Lyckegaard intend to develop it further. “What is better than a beautiful garden you can carry with you wherever you go?” she adds. please! make this dress available for the public! I'd love to wear one and grow plants! What a beautiful concept! No space for a garden? 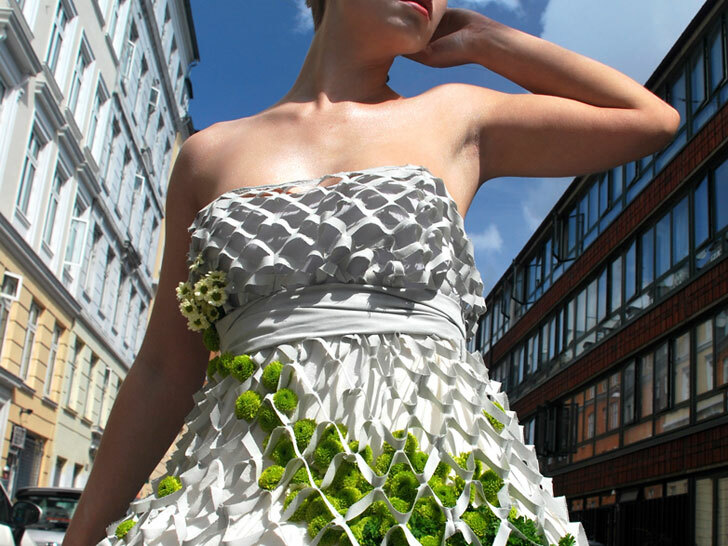 Ali Se�kin Karayol and Mette Lyckegaard's "Mesh" dress doesn't just anchor seeds for planting, but it also composts kitchen scraps to nourish them. The result is a portable, wearable garden that changes color and form with each passing day. More than that, however, it's a critique on the growing estrangement between urban dwellers and nature. "Our aim was to create a beautiful symbiosis between nature and citizens," according to the Karayol, who developed the concept with Lyckegaard for the Performative Design course at the Copenhagen Institute of Interactive Design. "It should be seen as citizens� opportunity to give back to nature and to immerse themselves in it by wearing their own small ecosystem."